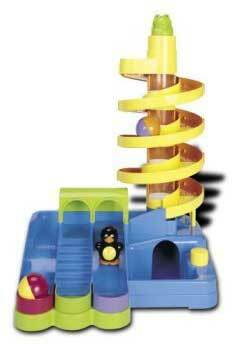 This Super Spiral Play Tower provides fast moving fun for little ones. Talk about fun for little ones who love action. Froggie slides down the tower and whistles as he goes. Penguin and two colorful balls spin and race down the spiral ramps and tracks to their designated spaces. Features super spiraling ramp. Press the button to release the frog and hear a bell ring. Toys to boost your kid's multiple intelligences. 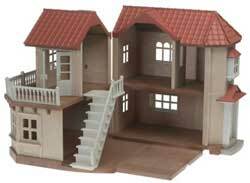 Give your Calico Critters a highly detailed, spacious and fun place to stay with this huge town home. There are 4 large rooms to decorate and a divider to create an additional room. The middle of the house swings open to expose rooms and allows you to slide in a moveable staircase. Plus, the town home has lights that turn on and off! Great for imaginative and creative play. For ages 3 years and up. Imported. 15Hx11Wx15L". Putting this learning toy together is more than half the fun. Kids create their own fun while learning basic engineering principles when they assemble this 380-pc. set into an aerial marble track suspended by a series of adjustable ties and anchors. When complete, marbles fly down over 30' of glow-in-the-dark track. 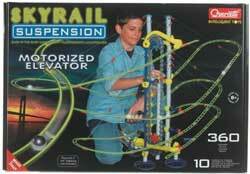 The motorized elevator brings the marbles back to top for repeat action. Imported.